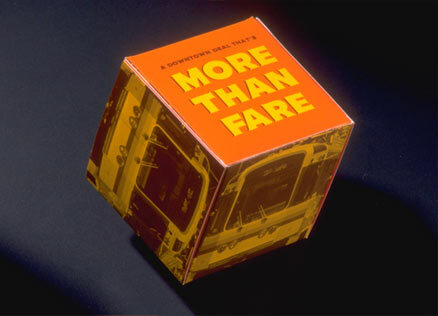 Chunk Mail® | Flynn and Friends, Inc.
"More Than Fare" meant a free ride plus money off. Who could resist? Generate business for downtown clubs and restaurants via the Transit Authority's MetroRail System. 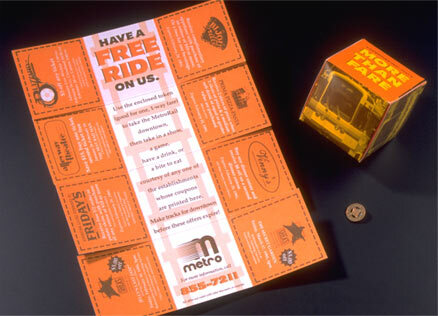 A uniquely constructed "cube" direct mailer containing an irresistible object – a token good for a "free ride" which stirred recipients curiosity by bouncing off the mailer walls when shaken. Discount coupons offered further enticement. Click "2" below to see inside. Flynn & Friends is an advertising, marketing, and website design firm located in Buffalo, New York.